Malala Yousafzai is this kind of role model that the world needs more of, the kind that leaves a most definite mark on the world. In a culture that tried to keep her down and silent, Malala chose not to be silent. But her courage nearly cost her her life when the Taliban attempted to kill her. After recovering, Malala continued her fight for girl's right to an education. Her efforts led to her being awarded the Nobel Peace Prize. But sadly, her fight is far from over. 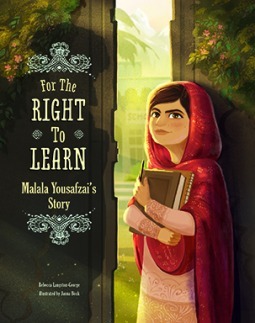 Not only does this book give a glimpse into the life of an amazing young woman in an appropriate way for older elementary students (the book is too long and might be frightening for younger students), but it clearly demonstrates a culture very different than most American children are familiar with. The book also shows the challenges inherent in trying to modify/change a culture's deep-seeded beliefs. But thanks to her own courage, and the support of her family and friends, Malala has already made a difference. The illustrations are touching and add a gorgeous side note to a powerful story. Those big brown eyes of Malala's are compelling to say the least. A cool idea with a big splash You know the Super Soaker. It's one of top twenty toys of all time. And it was invented entirely by accident. Trying to create a new cooling system for rockets, impressive inventor Lonnie Johnson instead created the mechanics for the iconic toy. A love for rockets, robots, inventions, and a mind for creativity began early in Lonnie Johnson's life. Growing up in a house full of brothers and sisters, persistence and a passion for problem solving became the cornerstone for a career as an engineer and his work with NASA. But it is his invention of the Super Soaker water gun that has made his most memorable splash with kids and adults. With a growing focus in education on encouraging students to develop interest in the sciences, books like this are so important. And to have the book address briefly the importance of persistence, creativity, and hard work add greatly to the power of the book. I also loved the fact that Lonnie's family supported him despite the lack of room for a 'workshop' for him. The let him collect 'junk' and rocket kits and other things that he used to invent. Johnson's accomplishments at a science fair with a hand built robot and with NASA are highlighted as well. The part of the book I found most interesting though was the section on when he quit his job to focus on his inventing only to have all his plans fall through. Many people might quit under such discouraging circumstances. By this time, Johnson had created a prototype of what would become the Super Soaker, but couldn't find a toy company willing to take a chance on in. But he kept looking until he found one willing to take the chance. And the rest is history. But despite making his fortune, the man continues to create to this day. An inspiring example for young and old alike, Lonnie Johnson proves the value of persistence and using one's skills to make a difference. Tate's illustrations are unsurprisingly gorgeous and complement the text beautifully. 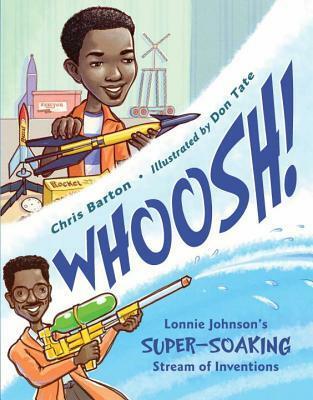 My favorite picture though shows Johnson demonstrating his water gun was a delightful 'WHOOSH'! An inspiring picture biography that belongs in most collections. I love this pairing--two role models who acted as children. What a great review! Would you be interested in linking up this post with the Diverse Children's Books Link-up? 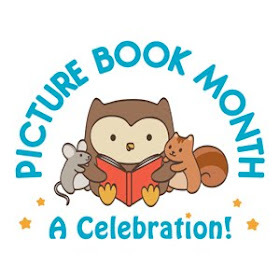 You can find it at http://pagesandmargins.wordpress.com/2016/06/18/diverse-childrens-books-link-up-june-18-july-1/. Thanks! Thanks for these! Whoosh! was a top review of mine this month too. PICTURE BOOK REVIEWS: Books about great dads!